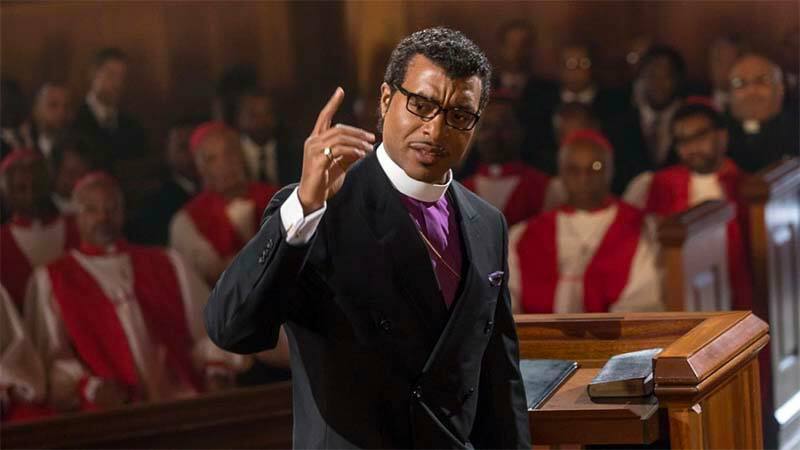 Come Sunday is a biopic that focuses on the revelatory and controversial experience of real-life pastor Carlton Pearson, played by Chiwetel Ejiofor. The film focuses on Pearson’s newfound belief in universal salvation and how it causes him to lose his influence, prestige, and congregation. While the movie does its best to capture the weight of Pearson’s decision to heed God’s voice and the impact his seemingly anti-Biblical views have on the Christian community he serves, its condensed explanation of his then-emerging theology leaves much to be desired; however, it is quite possible that this is a result of both the format of the medium and the intended audience. The film instead over-dramatizes how his beliefs pulled apart an interracial worship community, as this particular conflict better lends itself to cinematic exploration. Despite its shortcomings, I appreciated its effort to capture the hardship of walking in the call to preach. While the primary tension exists between Bishop Pearson and other church officials, there are ever-present subplots that serve to highlight the complicated and often paradoxical nature of being a part of the clergy. Throughout the course of the film, we see Mrs. Pearson struggle to be seen and heard by her husband, while simultaneously and repeatedly making peace with the fact that their marriage was practically arranged. When she voices her opinion about a poorly constructed advertising poster, she is questioned by her husband about why she embarrassed everyone with her commentary, to which she responds, “do you mean, you?” This push and pull between them is constant, and illustrates the bishop’s limitations as a husband. It is empowering to watch Mrs. Pearson stay true to character, no matter her husband’s response or request. Her character offers us a glimpse of a nontraditional first lady, who loves God and her family, but does not feel compelled to abide by church expectations of her comportment or dress. Bishop Pearson is oftentimes so caught up in church work that he is unable to see, understand, and appreciate that his wife loves and respects him enough to tell him the truth even if he does not want to hear it. Because his interaction/relationship with his wife is problematic, but not damning, it humanizes him, offering unique and rare insight into the preacher as man. In the beginning scenes, we hear from his own mouth how despite being tired from preaching seven sermons in four days and travelling across the country, he ushers a lady on his flight into salvation. He even shares with this stranger that he wrestles with conflicting emotions about being married and having children because of the spiritual upbringing. The physical, mental, emotional, and spiritual toll that this kind of work takes on a person is real. And in a space where people are in such need and desire the pastor to pray for them, visit their loved ones in the hospital, marry their children, and bury their parents the exhaustion this can produce in a pastor is easily and quite often overlooked. The events of Bishop Pearson’s life also highlight another challenge faced by spiritual leaders, the task of carefully existing in state of unreconciled paradox, balancing their ever-shifting beliefs from deep study, with that of the seemingly slower moving theological beliefs of the church. To be clear, I am not saying that clergy is more advanced or progressive than their flock, or that congregants operate like ancient dinosaurs, completely static in their beliefs. Rather, the relationship between a pastor and his people requires a delicate dance, and as seen in the events of Pearson’s life, if not performed just so, can have grave consequences. This film’s strength is that it does not attempt to glorify or make an idol of the man. Rather by showing him in his struggles, at his most vulnerable, we are able to witness the spiritual resolve needed to release and grow the relationships that reflect God’s love.